Expo Veneto: COME TO DISCOVER THE MOST ADVANCED TECHNOLOGIES FOR THE FOOD INDUSTRY! Event > COME TO DISCOVER THE MOST ADVANCED TECHNOLOGIES FOR THE FOOD INDUSTRY! COME TO DISCOVER THE MOST ADVANCED TECHNOLOGIES FOR THE FOOD INDUSTRY! A guided tour inside the factory of Turatti Srl, worldwide specialist in the custom design and manufacture of machinery and complete processing lines for the i fresh-cut and ready meals industry, in addition to the established Preserved, Frozen and Dehydrated ones. Our Mission (Providing the most innovative food processing solutions to help operators offering safe, value for money and high quality food products to customers) is perfectly in line with Expo 2015 claim “Feed the Planet, Energy for Life”. As a matter of fact, the Turatti group can count on its experience and ability to provide the greatest solutions in terms of productivity, flexibility and quality in the food industry. Beside its product improvement activities, Turatti has been developing innovative technologies to reduce environmental impact and power consumption, even before the term “sustainability” became fashionable. In conjunction with the most important event of the year, Expo 2015, our company open its doors to visitors and for all the duration of the World Exhibition, several machines and complete lines will be displayed, with the possibility to test the equipment with product. Our salesmen will be at your complete disposal for introducing you the Turatti machinery range and for showing you all the production operations that take place inside the factory. If you plan to attend the event, we kindly ask you to let us know in advance the date of your visit so we can organize everything in order to guarantee you a personalized tour, exclusively dedicated to you and your company. We are pretty sure that this event will meet your approval; for any further clarification do not hesitate to contact us. When: from Monday to Friday, from May to October. Time: from 09:00 to 17.00. How to book your tour: email to costanza.frezzato@turatti.com or call +39 0426 310731. Turatti is a world-leading specialist in the custom design and manufacture of machinery and processing lines to serve the food industry. We provide a comprehensive range of capabilities that enable the processors to add convenience, quality and value to a wide range of fruit and vegetables products . We supply standard machines or designs complete tailor-made systems, constantly investing to improve the quality and performance through a combination of know-how and innovation. Turatti has a long history of leadership in the food industry, boasting a wide experience in the agro industrial sector, where it has been operating for as many as five generations, designing and constructing machines and plants. The company has its head office in the Veneto region (not far from Venice) in an area that is traditionally dedicated to agricultural activities and it was founded in 1869.The Company activities have evolved during the course of the decades, varying from the construction of machinery for agriculture to the design and construction of machinery and plants for the agro industrial industry. Nowadays Turatti has become a leading global player and thanks to its state of the art facilities located in France (Turatti France) and California (Turatti North America), it has built a strong presence in the worldwide market. In 2001, the branch “Lion Food” was founded in order to design and produce machinery and equipment for industrial kitchens and catering services. Our Mission (Providing the most innovative food processing solutions to help operators offering safe, value for money and high quality food products to customers) is perfectly in line with Expo 2015 slogan. As a matter of fact, the Turatti group can count on its experience and ability to provide the greatest solutions in terms of productivity, flexibility and quality in the food industry. Beside its product improvement activities, Turatti has been developing innovative technologies to reduce environmental impact and power consumption, even before the term “sustainability” became fashionable. The production efficiency is a key element of sustainability and can be reached also by reducing and revaluating waste. 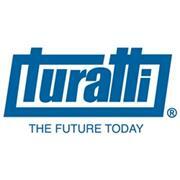 Turatti contributes to change the world, a machine or plant at a time. To achieve a high standard of quality offering numerous competitive advantages to companies in the food processing field, Turatti focuses incessantly on innovation. The research and planning phase involves permanent cooperation with numerous Italian and foreign universities: the result is the huge number of international patents. Once equipment construction is completed, particular attention is paid to finishing and quality control, which is carried out by experienced technicians in special areas. Leading worldwide groups rely on Turatti for finding solutions to their requirements, thanks to a cooperation that very often goes beyond the standard customer-supplier relationship for then becoming a joint research team. The constant Research and Development activities have gained Turatti different prestigious awards, such as the “Confindustria Award for Excellence”, the “Marco Polo Award” and the Cotec nomination as Italian example of innovation. The Turatti group mostly operates in the foreign market (Europe and outside Europe), therefore its commercial network can provide a global assistance whenever customers require it. The work specialization and experience in different countries is extremely beneficial for the Company, allowing it to achieve important goals and to grant technological excellence to its clients all day long.